112-9002-0045. Sterling Silver Souvenir State House Boston, Mass The Hub Boston Public Library Paul Revere Old South Church. Handle Obverse: embossed views of: "The Hub" + " Boston Public Library" + " Paul Revere" + " Old South Church" + "Beans": + "Bunker Hill" Monument. Handle Reverse: plain. Bowl: embossed view of "State House. Boston, Mass." Maker: Whiting. Metal: Sterling Silver. Length: 5 1/8 inches. Cost: $30.00. 113-9002-0047. Library Sterling Silver Souvenir Spoon Rockford, Illinois. Handle Obverse: Wallace's Floral Pattern: "Lily Pond " (??). [Patented: 1902-???]. Handle Reverse: decorative reverse. Bowl: gold-washed bright cut engraved view of "Public Library. Rockford, Ill." Maker: Wallace. Sterling. + "142." Metal: Sterling Silver. Length: 5 ¼ inches. Cost: $45.00. 14-9002-0049. Library Sterling Silver Souvenir Spoon Minneapolis Minnesota. Handle Obverse: embossed SS (State Seal) of Minnesota at the finial + embossed views of Lady's Slipper + grain shock + "Minnesota" on lower stem. Handle Reverse: embossed view of eagle at finial + stocks of grain. Bowl: bright cut engraved view of "Public Library. Minneapolis, Minn." Maker: Fessenden. 925/1000. Metal: Sterling Silver. Length: 5 ¼ inches. Cost: $35.00. 115-9002-0050. 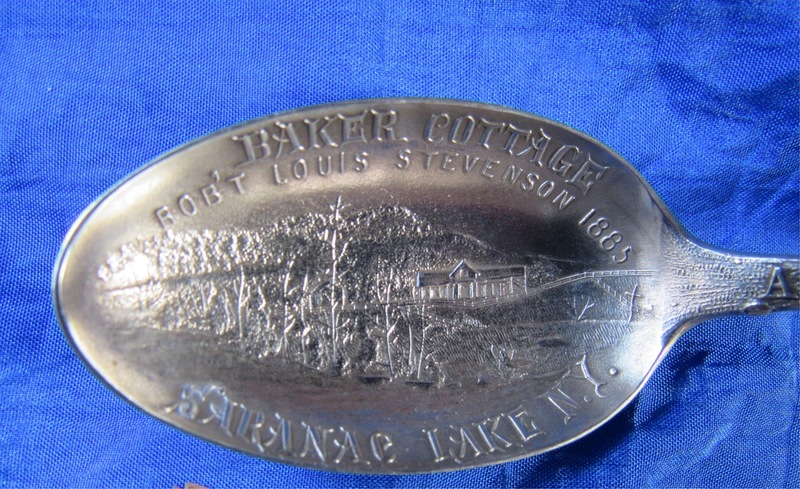 Sterling Silver Souvenir Spoon Brumback Library. Van Wert Ohio. Handle Obverse: Simpson Hall Miller's "Warwick" Pattern. [Patented: 1898]. Handle Reverse: decorative design. Bowl: bright cut engraved view of Brumback Library. Van Wert, Ohio." Maker: Simpson Hall Miller. Metal: Sterling Silver. Length: 5 ½ inches. Cost: $49.00. 116-9002-0052. 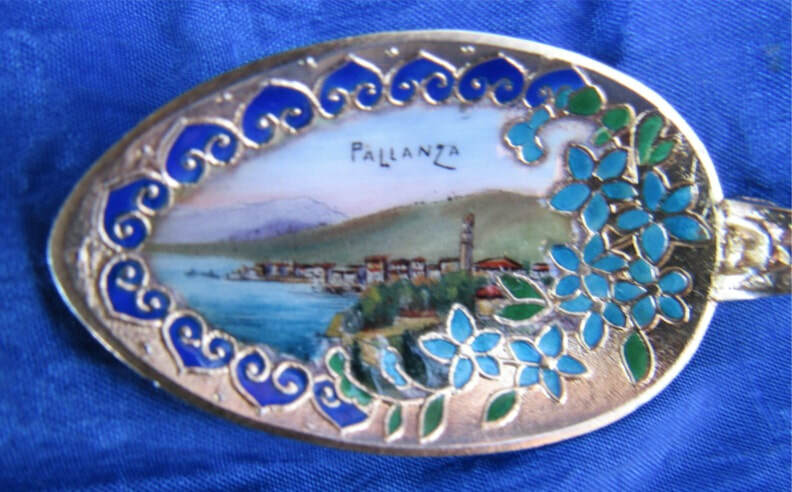 European 800 Silver Enamel Souvenir Spoon Pallanza Italy Lake Maggiore. A Rare spoon. Handle Obverse: enameled shield of the city of "Pallanza" at the finial end framed by decorative designs + decorative stem. Entire spoon = gold-washed. Handle Reverse: plain reverse. Bowl: enamel bowl with a view of city of "Pallanza" + Lake Maggiore + decorative flowers (for which the town was famous) flowing into the bowl. The enamel coloring in the bowl is stunning, vibrant, clean and distance. Bowl enamel = in mint condition. Maker: no maker marks; stamped 800. Metal: stamped 800. Length: 5 ½ inches. Cost: $395.00. 117-9002-0053. Sterling Enamel Demitasse Souvenir Spoon. Wavy Handled. Mexico Mexican Flag. Handle obverse. Enameled finial end with flag of "Mexico." Handle reverse: decorative reverse. Bowl: plain bowl. Maker: Shepard Mfg. Co. Metal: Sterling. Length: 4 inches.Cost: $45.00. 118-9002-0054. Sterling Silver Souvenir Spoon Mt Hood Portland Oregon Forestry Building Multnomah Falls Tillamook Rock Oregon Saw Mill Fir Trees. An Exquisite Souvenir Spoon. Handle Obverse: embossed view of rose ( = state flower) at the finial + embossed view of "Forestry Building" + "Multnomah Falls" + "Oregon" on lower stem. Handle Reverse: embossed view of "Mt. Hood" + "Tillmook Rock" + "Saw Mill" + "Oregon Fir Trees." Bowl: bright cut engraved view of "Mt. Hood11932 Ft. Portland." BL Rev. : monogrammed: "2-1-1908." Stamped: Sterling. Retailer: G. Heitkemper Co. Metal: Sterling Silver. Length: 5 ¾ inches. Cost: $55.00. 119-9002-0057. Sterling Silver Enamel Souvenir Spoon State Seal New York Paul Smiths. Handle Obverse: enameled SS (State Seal) of New York at finial + decorative lower stem. Spoon = gilded. Handle Reverse: decorative reverse. Bowl: bright cut engraved period script with: "Paul Smiths N.Y." Maker: no maker marks – but probably by Shepard. Metal: Sterling Silver. Length: 4 ¾ inches. Cost: $45.00. 120-9002-0059. Sterling Silver Souvenir Spoon Carnegie Library Charlotte Michigan. Handle Obverse: Shepard's "No . 52 " Floral Handle Pattern. [circa 1900]. Handle Reverse: decorative floral designs. Bowl: light gilded bright cut engraved view of "Carnegie Library. Charlotte, Mich." Maker: Shepard. Metal: Sterling Silver. Length: 5 ¼ inches. Cost: $49.00. 121-9002-0060. Library Sterling Silver Souvenir Spoon Milwaukee Wisconsin. Handle Obverse: Reed & Barton's "La Parisienne " Pattern. [Patented: April 15, 1902]. Handle Reverse: decorative reverse. Bowl: acid etched & engraved view of "Public Library. Milwaukee." Maker: Reed & Barton. Metal: Sterling Silver. Length: 6 inches.Cost: $49.00. 122-9002-0064. Sterling Silver Souvenir Post Office Kansas City Missouri Exchange Building Willis Wood Theatre. Handle Obverse: embossed view of CS (City Seal) of Kansas City + "Paseo" + banner with "Kansas City" + frontal view of a steel + corn cobs and leaves. Handle Reverse: embossed view of: "Exchange Building" + "Willis Wood Theatre" + "Junction." Bowl: embossed view of "Post Office. Kansas Mo." Maker: Banner H. Metal: Sterling Silver. Length: 5 ¾ inches. Cost: $45.00. 123-9002-0065. Sterling Silver Souvenir Chicago Post Office Grant Public Library Masonic Temple. Handle Obverse: embossed view of: "Post Office + "Grant" on horse + City seal + "Chicago" on lower stem. Handle Reverse: embossed views of: "Public Library" + Masonic Temple." Bowl: embossed view of "Post Office Chicago." Maker: Wallace. Metal: Sterling. Length: 4 ¼ inches. Cost: $25.00. 124-9002-0066. Sterling Silver Souvenir State Capitol Court House Public Library Soldiers & Sailors Monument. #66. Handle Obverse: embossed views of: "Court House" + "Public Library" + banner with "Des Moines" + "Sold(ier) & Sail(or) Mon(umen)t." on lower stem. Handle Reverse: embossed view of SS (State Seal) of Iowa + pig and coq + corn cobs & leaves. Bowl: embossed view of "Iowa State Capitol. Des Moines." Maker: Shepard. Metal: Sterling Silver. Length: 6 inches.Cost: $49.00. 125-9002-0067. Sterling Silver Souvenir Skyline St. Louis: Public Library Municipal Courts Union Station Jefferson Memorial New Cathedral. Handle Obverse: embossed views in a cut out handle of: "Public Library" + "Municipal Courts" + "Union Station" + "Jefferson Memorial" + "New Cathedral" + "St Louis Mo." on lower stem. Handle Reverse: plain reverse. Bowl: plain. Maker: Watson & Newell. Metal: Sterling Silver. Length: 6 inches. Cost: $28.00. 126-9002-0068. Sterling Silver Souvenir Spokane Falls Seattle Washington Post Office Carnegie Library. Handle Obverse: embossed medallion seal of the "City of Spokane Washington" + embossed view of "Court House" + view of man with broad brimmed hat + "Spokane" on lower stem. Handle Reverse: embossed view of "U.S. Post Office" + "Carnegie Library" + tall pine tree. Bowl: embossed cityscape view of "Spokane Falls. Spokane, Wash." Maker: Mayer Bros. Metal: Sterling Silver. Length: 5 ½ inches. Cost: $45.00. 127-9002-0069. Library Sterling Silver Souvenir Spoon Public Library Chicago, Illinois. Handle Obverse: Pattern Hdle by Baker-Manchester. [date: = unknown]. Handle Reverse: decorative reverse. Bowl: bright cut engraved view of "Public Library. Chicago, Ill." Maker: Baker-Manchester. Metal: Sterling Silver. Length: 6 inches. Cost: $45.00. 128-9002-0070. Sterling Silver Souvenir Spoon Santa Rosa California Library. Handle Obverse: embossed floral (poppy flower) handle. Handle Reverse: embossed reverse view of the poppies. Bowl: bright cut engraved view of "Public Library Santa Rosa, Cal." Maker: Mayer Bros. Metal: Sterling Silver. Length: 5 ¾ inches.Cost: $45.00. 129-9002-0072. Public Library Sterling Silver Souvenir Spoon Chicago Illinois. Handle Obverse: embossed profile view of Indian with feather headdress facing left + "Chicago" on lower stem. Handle Reverse: plain reverse. Bowl: embossed view of "Public Library. Chicago." Maker: Banner H. Metal: Sterling Silver. Length: 3 ¾ inches. Cost: $18.00. 130-9002-0073. Sterling Silver Souvenir Spoon Ryerson Public Library Grand Rapids Michigan. Handle Obverse: Towle Pattern [unidentified]. Handle Reverse: decorative reverse. Bowl: bright cut engraved view of "Ryerson Public Library. Grand Rapids, Mich." Maker: Towle. Metal: Sterling Silver. Length: 5 ¾ inches.Cost: $45.00. 131-9002-0074. Sterling Silver Souvenir Spoon Public Library Burlington, Iowa. Handle Obverse: Alvin's "Bridal Rose" Pattern. [Patented: 1900]. Handle Reverse: decorative design. Bowl: light gold-washed bright cut view of "Public Library. Burlington, IA." Maker: Alvin. Metal: Sterling Silver. Length: 6 inches.Cost: $49.00. 132-9002-0075. European Brass Souvenir Spoon Tragic Roman Mask for theater. Handle Obverse: full figure chimera type figure at the finial with large wings + decorative twist stem + head (female) at the bottom of the stem. Handle Reverse: ditto above. Bowl: embossed face – of "tragedy mask" – used in Roman plays at the theater. Maker: no maker mark. Metal: European Brass. Length: 4 ¾ inches. Cost: $20.00. 133-9002-0077. Sterling Silver Souvenir Spoon Arkansas Traveller Little Rock Ark. Handle Obverse: embossed floral pattern handle by Shepard. Handle Reverse: decorative reverse. Bowl: bright cut view of "Arkansas Traveller Little Rock Ark." Light gilded bowl. Bright cut images = exquisitely done by a master engraver. Maker: Shepard. Metal: Sterling Silver. Length: 5 ¼ inches. Cost: $45.00. 134-9002-0079. European Silver Souvenir Spoon Suomi Finland. Handle Obverse: embossed decorative finial with enamel crest of "Suomi" + embossed pinecones and leaves + decorative stem. Handle Reverse: plain. Bowl: plain. Maker: lion + crown + 813H + U6. Metal: European Silver. Length: 5 1/8 inches. Cost: $12.00. 135-9001-0001xb. Sterling Silver Souvenir Spoon Boston Entrance Subway Hub State House. Handle Obverse: embossed view of fish at the finial + "State House" + "Washington Elm Cambridge" + "The Hub" + "Boston" on lower stem + "Beans" at bottom. Handle Reverse: embossed views of "Public Library" + "Faneuil Hall " + "Old South Church" + "Old State House" + Bunker Hill Monument. Bowl: embossed view of scene with "Entrance to the Subway. Boston." Maker: Banner H. Metal: Sterling Silver. Length: 5 7/8 inches. Cost: $39.00. 136-9001-0002xb. Bronze Souvenir Spoon World War 1 Doughboy New Orleans. Handle Obverse: embossed full figure World War 1 doughboy (at attention w/ rifle on shoulder) standing on plinth + "U.S.A." on stem. Handle Reverse: embossed reverse view of doughboy – concave design. Bowl: dot engraved city name: "New Orleans." Maker: Watson & Newell. Metal: Bronze. Length: 5 ½ inches.Cost: $65.00. 137-9001-0003xb. Sterling Silver Souvenir Spoon New York Grant's Tomb. Handle Obverse: Pattern handle [pattern = unidentified] engraved with city name: "New York." Handle Reverse: plain back. Bowl: bright cut engraved with view of "Grant's Tomb." Maker: Rogers, Lunt, Bowlen. Metal: Sterling Silver. Length: 5 ¼ inches. Cost: $25.00. 138-9001-0004xb. Sterling Silver Souvenir Spoon State Capitol Des Moines Iowa. Handle Obverse: embossed pattern handle # 52 (by Shepard). Handle Reverse: decorative back. Bowl: bright cut engraved view of "Stat Capitol Des Moines Iowa." – a superb bright cut engraved image by a master craftsman. Maker: Shepard # 52. Metal: Sterling Silver. Length: 5 ¼ inches. Cost: $30.00. 139-9001-0044xb. Sterling Silver Souvenir Spoon Bullrushes Fort Pitt Pittsburg, PA. Handle Obverse: embossed images of bulrushes form the handle. Handle Reverse: plain reverse. Bowl: embossed view of "Fort Pitt. Pittsburg, Pa." Maker: P&B = Paye & Baker. Metal: sterling silver. Length: 4 inches. Cost: $20.00. 140-9001-0006xb. Enamel Sterling Souvenir Spoon Napoleon Portrait Bowl. Enamel = Excellent condition. Handle Obverse = eagle with spread out wings holding arrows and laurel branch in talons + "Paris"— on plinth below [minimal amount of white enamel missing in the upper right hand corner]. Bowl: enameled frontal portrait view of Napoleon Bonaparte within rope thread design; flowers and leaves decorate the surrounding area. Exquisite Napoleon souvenir spoon. Skilled artist painted the portrait of Napoleon; colors and shading = excellent. Portrait captures the character of Napoleon at this time of his life. Maker: Marked: .800 + Import. Length: 5 inches. Cost: $350.00. 142-9001-0009xb. Sterling Silver Souvenir Spoon William Shakespeare — Entire spoon = gilded. Handle Obverse: Frontal portrait bust of William Shakespeare + enameled panel with view of Shakespeare's Birthplace + "William Shakespeare" signature on decorative stem. Handle Reverse: plain back. Bowl: bright-cut engraved "Stratford-on-Avon." Maker: maker mark; anchor + lion + a (Birmingham. 1900) + RD 152874. Metal: silver. Length: 5 inches. Cost: $35.00. 43-9001-0010xb. Sterling Silver Souvenir Spoon Coal Breaker Scranton Pennsylvania. Handle Obverse: embossed view of SS (State Seal) of Pennsylvania + embossed view of train and train track entering a mine shaft + "Pennsylvania" on lower stem. Handle Reverse: embossed view of mining site and smelter buildings. Bowl: gilded bright cut view of "Coal Breaker. Scranton Pa." Maker: Manchester. Metal: Sterling Silver. Length: 5 ¼ inches. Cost: $35.00. 144-9001-0011xb. 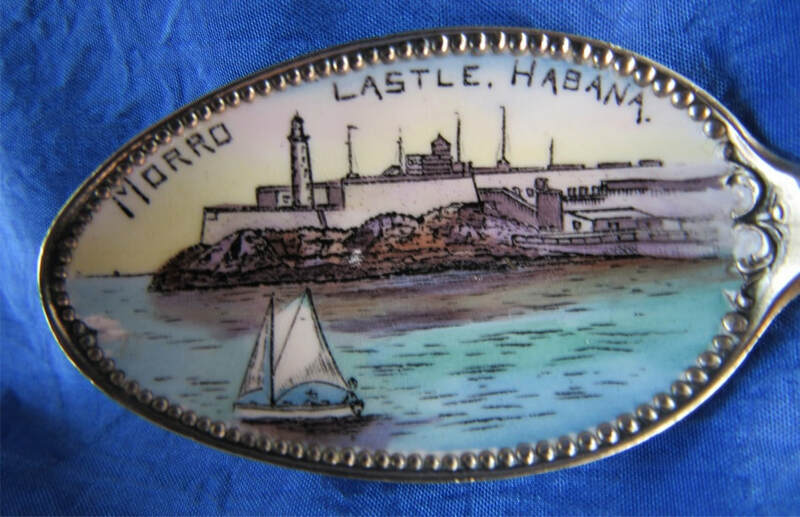 Enamel Sterling Souvenir Spoon Morro Castle Habana Fish Handle. Handle Obverse: a magnificent fish with scrolling waves around body and tail. Bowl: This spoon a view of "Morro Castle, Habana" across the bay with a sail boat in the foreground. Bowl has a beaded edge. Colors are vibrant, shading excellent. Bowl Enamel = Excellent condition for its age; BUT, there are two small chips – a minor chip to the left of the sail boat; and, chipped enamel in the scrolls on the right side of the bowl just below the handle. The missing enamel does not affect the overall bowl scene. Maker: marked Sterling (no maker). Length: 6 inches. Cost: $210.00. 145-9001-012xb. Sterling Silver Souvenir Spoon Kamehameha Diamond Head Hawaii. Handle Obverse: embossed view statue of King Kamehameha standing on pedestal (original statue stands in front of Post Office in Honolulu) + "Honolulu" on lower stem. Handle Reverse: decorative back. Bowl: embossed view of "Diamond Head" in the distance + outrigger + two people walking on beach. Maker: Gorham. Metal: Sterling. Retailer: F.H. Wichman. Length: 5 ½ inches. Cost: $65.00. 146-9001-0014xb. Sterling Silver Souvenir Indianapolis Skyline Spoon State Capitol, Soldier & Sailor Monument Government Building. Handle Obverse: embossed view of "State Capitol" at finial end + shank = the upside-down Soldiers & Sailors Monument. Handle Reverse: embossed with words: "Indianapolis, Ind." Bowl: embossed view of "Government Building. Indianapolis, Inc." Maker: B -M. Co. = (Baldwin, Miller Co., Inc.). Sterling. Length: 5 7/8 inches.Cost: $65.00. 147-9001-0016xb. Silver (unmarked 800) Enamel Souvenir Spoon Nürnberg Marriage Bridal Wager Cup i.e. Jungfraubecher. Handle Obverse: on finial = a Sterling Silver Marriage (or Bridal) Cup – also called a Wager Cup. Handle Reverse: plain back. Bowl: Magnificent enameled detailed view of Nürnberg with "Burg" above the buildings of the city. Wonderful cityscape perspective and detail of the buildings in the city. Maker: no maker marks. Metal: tested: 800. Length: 5 ¼ inches.Cost: $225.00. 148-9001-019xb. Bronze Souvenir Spoon Miner "Struck It At Last" Denver, Colorado. Handle Obverse: full figure embossed miner holding nugget in left hand and a pick ax in right hand+ "Struck It At Last" on lower stem. Handle Reverse: embossed reverse view of copper full figure miner. Bowl: shovel shaped bowl + dot engraved: "Denver Colo." Maker: no maker marks – (probably made by Shepard or Watson & Newell). Metal: bronze. Length: 4 1/8 inches.Cost: $46.00. 149-9001-0022xb. Sterling Silver Souvenir Spoon Ohio University. Handle Obverse: embossed medallion seal of the Ohio University with the name and motto: "Sigillum Universitatis Ohiensis MDCCCIV" + "Religio Doctrina Civilitas, Prae Omnibus Virtus." Ohio University is in Athens, Ohio. Handle Reverse: monogrammed with the letter "B." Bowl: plain bowl. Maker: Rogers, Lunt Bowlen. Metal: Sterling Silver. Length: 5 ¾ inches.Cost: $25.00. 150-9001-023xb. Sterling Silver Souvenir Spoon Minneapolis Minnesota - State Seal Lady Slipper. Handle Obverse: embossed view of SS (State Seal) of Minnesota at finial + embossed view of lady slipper (state flower) + "Minnesota" on lower stem. Handle Reverse: decorative back. Bowl: gilded bowl with bright cut engraved city name: "Minneapolis." Maker: No maker mark. Stamped "Sterling." Metal: Sterling Silver. Length: 5 ¾ inches. Cost: $28.00. 151-9001-0025xb. Sterling Silver Souvenir Spoon Faneuil Hall Bunker Hill Old State House Boston Massachusetts. Handle Obverse: embossed views of "Faneuil Hall" at finial + "Bunker Hill" + "Boston" on lower stem. Upper stem has scalloped edges. Handle Reverse: decorative back with scallops on edges. Bowl: embossed view of "Old State House." Maker: Frank M. Whiting. Metal: Sterling. Length: 6 inches. Cost: $39.00. 152-9001-0026xb. Shepard Ring of Roses. Enamel Sterling Souvenir Spoon Oranges Tampa Florida. Hdle obv. Ring of Roses enamel finial with fruit [oranges, flower, leaves]. Bowl: Citrus bowl; embossed decorative designs + bright cut engraved "Tampa, Fla." Maker: Shepard Mfg. Co. + 46. Metal: Sterling Silver. Length: 5 ½ inches.Cost: $85.00. 153-9001-027xb. Sterling Silver Souvenir Spoon State Capitol Columbus Ohio. Handle Obverse: embossed view of "State Capitol. Columbus, Ohio." Handle Reverse: plain reverse. Bowl: plain bowl. Maker: Watson Newell. Metal: Sterling Silver. Length: 5 ½ inches. Cost: $20.00. 154-9001-0028xb. Sterling Silver Souvenir California Skyline Spoon Golden Gate. Handle Obverse: embossed view of San Francisco harbor with mountains, sailboat and setting sun in the distance + "Golden Gate" over the rays of the sun. Handle Reverse: plain back. Bowl: gilded bowl + bright-cut engraved period script: "San Francisco, Cal." Maker: Wallace. Sterling. Length: 5 5/8 inches. Cost: $55.00. 155-9001-030xb. Silver (800) Enamel Souvenir Spoon Coblenz (Koblenz). Handle Obverse: on finial = enameled Coat of Arms of Coblenz + decoration on stem. Entire Spoon = gilded. Handle Reverse: plain back. Bowl: engraved "Coblenz" in bowl . Maker: maker marks = SM. Metal: Marked 800. Length: 4 3/8 inches.Cost: $20.00. 156-9001-0032xb. Sterling Silver Souvenir Spoon Temple of Music. Pan American Exposition. Buffalo, N.Y. 1901. Handle Obverse: embossed frontal head of a buffalo + twist stem. Bowl: bright-cut engraved view of "Temple of Music" + "Pan American Exp." + "Buffalo, N.Y. 1901." Maker: 925/1000. Sterling. (possibly made by Fessenden). Length: 5 ¼ inches. Cost: $445.00. 157-9001-0033xb. European Silver Enamel Souvenir Spoon Naples Grand Hotel Vesuvius Italy. Handle Obverse: The Naples "Prancing Horse" in full figure (F&B) is at the finial; horse = stands on a plinth. Decorative lower stem. The word "Naples" = on the plinth below. Winged figure at the lower stem above the bowl. See below for more information on the prancing horse. Handle Reverse: Decorative stem and reverse view of the "Prancing Horse" + "Gd Hotel" on the plinth below. Bowl: enamel view of the Grand Hotel Vesuvius in Naples. (see details about hotel below). Enamel in the bowl = in mint condition. See postcard pictures of the hotel. Maker: no maker marks. Unmarked 800 European silver. Metal: Unmarked 800 European silver. Length: 5 ¼ inches. Cost: $275.00. 158-9001-0034xb. 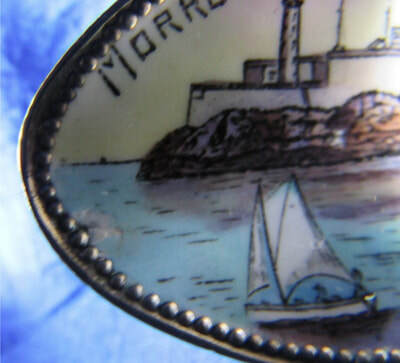 Sterling Silver Enamel Souvenir Spoon Blue Urn Naples Vesuvius View. Handle Obverse: enamel blue urn [in mint condition] at finial end with classical scene – two Cupids, each with two wings, standing around an altar; Cupids are represented in opaque white color. Colored stem decorated with red and white enameled dots (17 on each site – front and back). The urn has magnificent handles. Entire spoon = gold washed. Handle Reverse: scene on reverse = seated figure, probably Venus / Aphrodite who is approached by Cupid figure carrying a small tray with bottle of perfume. Bowl: enamel bowl [mint condition] with view of the traditional scene of the Bay of Naples with pine trees in the foreground, Naples in the medium distance and Mt Vesuvius (with smoke above) in the distance. Maker: maker marks on bowl reverse: pine tree + head + 800 (probably German maker). Metal: stamped 800 Length: 5 ¾ inches.Cost: $295.00. 159-9001-0035xb. Sterling Silver Souvenir Spoon "Mt. Hood. 11932 ft." Webfoot. Handle Obverse: enameled view of "Mt. Hood. 11932 ft" + decorative wavy stem. Handle Reverse: plain back with scalloped decorative edges. 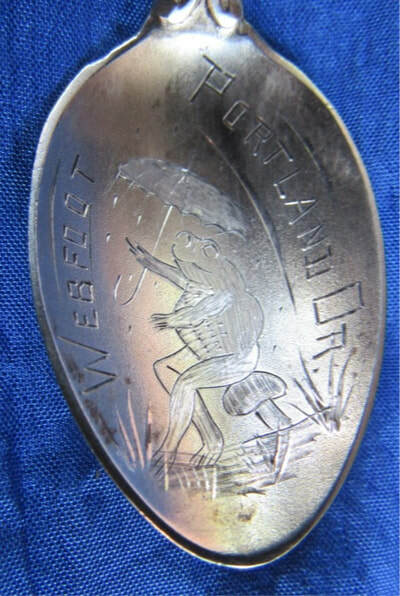 Bowl: bright cut engraved view of frog seated on tripod & holding an umbrella + "Webfoot. Portland, Or." Maker: Shepard. Length: 4 inches. Cost: $65.00. 160-9001-0036xb. Sterling Silver Souvenir Spoon Chicago Grant Monument, New County Building, First National Bank, Fort Dearborn, Auditorium, Masonic Temple. Handle Obverse: embossed view of city seal of Chicago at finial + embossed views of "New County Bldg." + "First National Bank" + "Chicago" on lower stem + goldenrod at lower stem. Handle Reverse: embossed views of "Fort Dearborn" + "Auditorium" + "Masonic Temple" + stalk of grain (perhaps bearded wheat stalk). Bowl: embossed view of "Grant Monument. Chicago." Maker: Watson-Newell. Sterling. Length: 5 ½ inches. Cost: $35.00. 161-9001-0037xb. Sterling Silver Souvenir Spoon Totem Pole Old Church Tacoma Washington. Handle Obverse: embossed view of totem pole. Handle Reverse: embossed with "Indian Totem Pole." Bowl: bright-cut engraved view of "Old Church. Tacoma" with satin finished bowl. Exquisite bright-cut engraving by a master engraver. Maker: Mayer Bros. Sterling. Length: 5 ¼ inches. Cost: $45.00. 162-9001-0040xb. New Mexico. Enamel Alvarado Hotel. Handle obverse. "Alvarado" on banner at finial + emb. vws of city seal + man on horseback + Indian maiden water carrier + pick, shovel, miner's pan + sword covered by laurel. Handle reverse. emb. vws of "Home of Mrs. Phil Sheridan" + "Rio Grande Bridge" + "Adobe House." Bowl: enamel view of "Alvarado Hotel. Albuquerque, N.M." Maker: Banner H. Sterling. [6"]. Mint condition. Cost: $425.00. 163-9001-0042xb. Sterling Silver Souvenir Spoon Wesley Church. Handle Obverse: cut-out handle with the word "Wesley" within a decorative border. Handle Reverse: reverse of the obverse. Bowl: bright-cut engraved view of "Wesley Church." (location of this church is not known – perhaps, Minneapolis (MN), Quarryville (PA), Dover (DE) and various other sites. If anyone can identify the location of this Wesley Church, please advise. Thank you. Maker: Wedlich. Sterling. Length: 5 ½ inches. Cost: $35.00. 164-9003-0083. Silverplate Souvenir Bottle Opened Jolly Hotels Italy. Handle Obverse: bottle and can open. Engraved "Jolly Hotels." Metal: Silverplate. Length: 4 ¾ inches. Cost: $10.00. 165-9003-0084. Unique Sterling Silver Souvenir Spoon Statue of Liberty Lily of Valley Whiting. Handle Obverse: Whiting's Lily of the Valley handle. Handle Reverse: acid etched and engraved view of the Stature of Liberty. Bowl: plain. Maker: Whiting. Metal: Sterling Silver. Length: 5 7/8 inches.Cost: $49.00. 166-9003-0085. Sterling Silver Souvenir Spoon New Orleans Margaret Gaffney Haughery. Handle Obverse: decorative stem + included plant stalk (i.e. sugar cane) + leaves with branch on which are three bolls of cotton. Handle Reverse: decorative foliage on the reverse. Bowl: embossed view of a woman statue seated with a young child standing at her side. On the banner are the words: "New Orleans LA." Above the banner is a bird (brown pelican) with spread wings protecting her nest of three chicks. The woman represented on the chair is Margaret Gaffney Haughery (1813-1882). The monument to Margaret was unveiled on July 9, 1884. Maker: Gorham. Retailer: Wm. Franz & Co. Metal: Sterling Silver. Length: 6 inches. Cost: $55.00. 167-9003-0086 Sterling Silver Spoons Spoon . Stockbridge Mission Tower Hdle obv. embossed view of "Mission Tower 1739 - `1878" + branch of leaves w/ "Stockbridge Mass." BL: embossed view of Laurel Hill w/ "Laurel Hill. Sedgwick Gift 1854" cut into rock. MK: Alvin. Metal: Sterling. Length: [4 ¼"].Cost: $38.00. 168-9003-0087. Sterling Silver Souvenir Spoon Gorham's Christmas Santa Claus Fire Place. Hdle obv: embossed view of Santa Claus climbing into to (or out of) brick chimney + holly leaves and bells + "Twas the Night before Christmas" on lower stem. Hdle rev: embossed view of Santa Claus with sack on his back + detailed brick chimney + holly leaves and bells. BL: embossed view of two stocking hanging on fireplace mantle on which are a clock, 2 baby's shoes and candle. MK: Gorham. Metal: Sterling Silver. Length: 4 ¼ inches. Cost: $42.00. 169-9003-0088. Silverplate Souvenir Spoon Assyrian Pattern. Hdle obv. Roger's "Assyrian" pattern – patented 1886. Hdle rev. plain. BL: plain. MK: 1847 Rogers Bros. A1. Metal: silverplate. Length: 3 ½ inches.Cost: $25.00. 170-9003-0089. Sterling Silver Souvenir Spoon Skyline Tampa Florida Government Building Church of the Sacred Heart. Handle Obverse: embossed view of skyline of Tampa. This is a Tampa Bay Hotel - now University of Tampa spoon (on Front) with important city buildings on the back. Handle Reverse: embossed views of "Church of the Sacred Heart" + "Government Building" + "Tampa, Fla." Bowl: plain bowl [minor scratches in bowl obverse and also on bowl reverse; several very tiny nicks on bowl edges]. MK: Paye & Baker. Sterling. [5 ½ inches].Cost: $95.00. 171-9003+0090. Silverplate Silver Souvenir Spoon Louisiana Purchase Jefferson Palace of Machinery. Handle Obverse: date "1904" at the finial + embossed view of eagle + map of US showing Louisiana Purchase + portrait of Jefferson + "St Louis" on lower stem. Handle Reverse: embossed view of "Cascade Gardens" + shield with "Lake Shore Michigan Southern Railway." Bowl: embossed view of "Palace of Machinery." MK: Unidentified maker. Metal: Extra Plate. [6 inches]. Cost: $20.00. 172-9003-0091. Sterling Silver Souvenir Spoon Full Figure USA Navy Sailor. Handle Obverse: embossed navy sailor in naval dress +"US Navy" on lower stem. Handle Reverse: embossed reverse view of officer in naval dress. Bowl: plain bowl. MK: Robbins. Sterling. [5 ½ inches]. Cost: $65.00. Note: This souvenir spoon was designed and patented by Frederick Schwinn, Attleboro, Mass. U.S. Patent No. 51396. Patent Date: October 16, 1917. Made in sterling and also made in bronze later. 173-9003-0092 Sterling Silver Souvenir Spoon USA Doughboy Full Figure Camp McClellan Alabama. Handle Obverse: embossed full figure frontal view of USA doughboy with rifle over shoulder + "USA" on lower stem. Handle Reverse: embossed view of the back of the doughboy. Bowl: bright cut engraved period script name: "Camp McClellan, Ala." MK: Robbins. Sterling [5 ½ inches]. Cost: $65.00. 174-9003-0093. 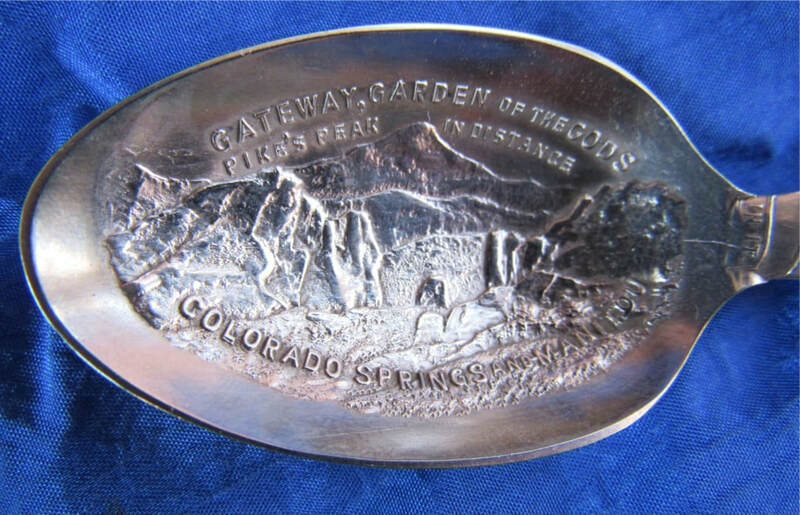 Sterling Silver Souvenir Spoon Miner Garden Gods Pike's Peak Struck It Rich at Last. Handle Obverse: embossed FF [full figure] statue of miner with pick resting on shoulder + "Struck it Rich at Last" + winch + "Millions in it" on banner on lower stem. Handle Reverse: embossed view of reverse of miner. Bowl: embossed view of "Gateway Garden on the Gods. Pike's Peak in Distance. Colorado Springs-an-Manitou." MK: E.L.D. Sterling Silver. [ 6 inches]. Cost: $135.00. 175-9003-0094. Sterling Silver Souvenir Spoon Ethan Allen Fort Ticonderoga. Handle Obverse: embossed view of "Fort Ticonderoga" at the finial + embossed profile portrait of "Ethan Allen" + "1775" + "I demand this for tin the name of the great Jehovah and the Continental Congress." Handle Reverse: plain. Bowl: plain. Maker: no maker mark. Retailer: F. W. Sim & Co. Metal: Sterling Silver. Length: 4 ¼ inches. Cost: $65.00. 176-9003-0095. Sterling Silver Souvenir Spoon Pointed Handle Park Hotel Mt. Clemens Michigan. Handle Obverse: Beaded edge on a pointed handle. + engraved name of city: "Mt. Clemens Mich." Handle Reverse: Plain reverse Bowl: bright-cut engraved view of "Park Hotel." Maker: L.D.A. Sterling. Length: 6 ¼ inches. Cost: $62.00. 177-9003-0096. Sterling Silver Souvenir Spoon Pointed Handle Piedmont Church Worcester, Massachusetts. Handle Obverse: Beaded edge on a pointed handle. Handle Reverse: Plain reverse. Bowl: bright-cut engraved acid etched view of "Piedmont Church" – (located in Worcester, Mass.) – See picture of the church. Maker: R.W.s.Co. Sterling +"Pat. 189-[??] final number missing. The date on this spoon is important since it gives the time period for these pointed handle souvenir spoon, Length: 5 ¼ inches. Cost: $65.00. 178-9003-0097. Sterling Silver Souvenir Spoon Pointed Handle Hotel del Monte. Monterey, Cal. Handle Obverse: Beaded edge on a pointed handle. Engraved with "Monterey, Cal." Handle Reverse: Plain reverse. 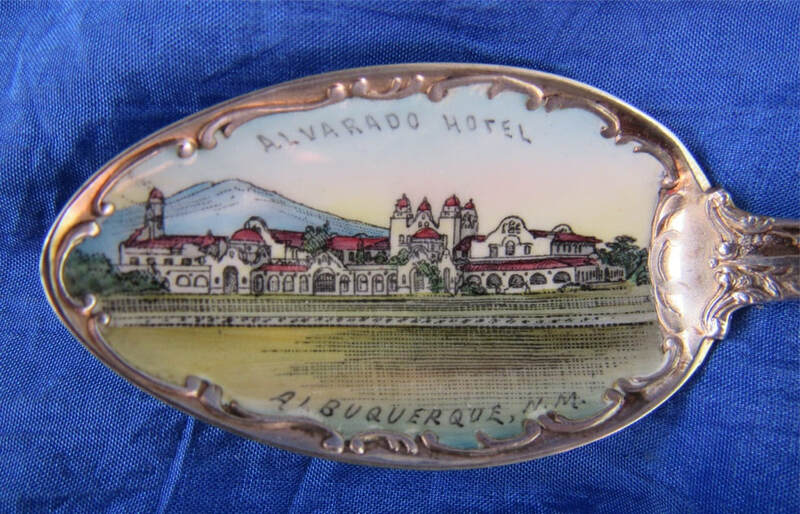 Bowl: bright-cut engraved view of "Hotel Del Monte." Excellent engraved image of the hotel. Maker: R.W.s Co. L.D.A. Sterling. Length: 6 ¼ inches. Cost: $65.00. 179-9003-0098. Sterling Silver Souvenir Totem Pole handle Mt. Rainier. 14444 ft. Seattle. Handle Obverse: embossed view of totem pole. Handle Reverse: stamped: "Alaska Totem Pole." Bowl: bright cut engraved view of "Mt. Rainier. 14444 ft. Seattle." Maker: Mayer Bros. (early mark). Metal: Sterling Silver. Length: 5 inches. Cost: $49.00. 180-9003-0099. Silverplate Souvenir Spoon Charter Oak Hartford Post Nubila Phoebus. Hdle Obv: embossed view of oak tree at the finial (i.e. Charter Oak) + oak leaf + "Hartford, Conn." on stem. Hdle Rev: embossed oak leaves. BL: embossed scallop-shaped bowl + Hartford city seal w/ "Post Nubila Phoebus." MK: anchor + Rogers + anchor + XII. + Pat. Ap'd For. Metal: Silverplate. Length: 4 ¼ inches. Cost: $30.00. 181-9003-0100. George Washington. Hdle obv. embossed frontal portrait bust of George Washington on medallion at the finial + twist stem. MK: no maker marks. Stamped: Sterling. Length: 4 inches.Cost: $15.00. 182-9003-0101. A very rare Spoon. Plymouth. Mass. Hdle obv. embossed view of 6 columned temple structure + 4 columned structure surrounding Plymouth Rock + "Plymouth" on lower stem. Hdle rev. plain. BL: embossed view of "Forefathers Monument. Plymouth." MK: CB&H. Sterling. [4"]. Cost: $30.00. 183-9003-0102. North Carolina. Rowland. Hdle obv. embossed view of SS of North Carolina w/ "Esse Quam Videri" on a banner + "North Carolina" on the lower stem. Hdle rev. embossed decorative designs on the reverse. BL: bright cut engraved city name: "Rowland N.C." MK: Manchester. Metal: Sterling. Length: 5 ¼ inches.Cost: $30.00. 184-9003-0103. Milwaukee. Wisconsin Floral handle. Hdle obv. embossed view of flowers (violets) and leaves at the finial end. Hdle rev. embossed reverse view of flowers and leaves on the reverse side. BL: bright cut engraved city name: "Milwaukee, Wis." MK: Manchester. Stamped: Sterling. Length: 5 ¼ inches. Cost: $25.00. 185-9003-0104. Carnegie Library. Pittsburg, PA. Floral handle. Hdle obv. embossed "Pond Lily" pattern by Paye & Baker. BL: bright cut engraved view of "Carnegie Library. Pittsburg, PA." MK: P&B. Metal: Sterling. Length: 5 ½ inches. Cost: $28.00. 186-9003-0109. Owl Pattern by Rogers. Hdle obv. 1847 International Rogers Bros. Pattern identified as "Owl" (Patented in 1892). More about this spoon. See: Tere Hagan. Silverplated Flatware (p. 82). MK: Rogers Bros. A1. Length: 4 ¼ inches. Cost: $10.00. 187-9003-0110. Souvenir of Gibraltar. Hdle obv. embossed & engraved decorative handle. BL: engraved text: "Souvenir of Gibraltar." MK: (panther + Lion + Q) = London 1891. CB = Charles Boyton (???) Length: $ ½ inches.Cost: $20.00. 188-9003-0111. Mt Rushmore. Hdle obv. cut out finial with embossed view of "Mt. Rushmore" w/ "Washington, Jefferson, Roosevelt Lincoln" on a banner. MO maker marks. Metal: Pewter. Length: 4 ¼ inches.Cost: $10.00. 189-9003-0112. Washington. U.S. Capitol. Hdle obv. cut out finial with embossed view of "U.S. Capitol" + "Washington B.C." on stem. BL: plain. MK: Richmond. Metal: Sterling. Length: 5 ¼ inches. Cost: $12.00. 190-9003-0113/0114. Copper Spoons. (teaspoon and demitasse). embossed view of "Opera House. Central City, Colo." Length: Teaspoon: 5 3/4 inches. Demitasse: 4 1/4 inches. Metal: Copper. Two Spoons for one money. Cost: $20.00. 191-9003-0117. Enamel Sterling Silver Bermuda Policemen. Hdle obv. paling sterling handle with applied enamel image of a Bermuda policeman (blue pants, white coat and hat). BL: engraved city name: "Freeport." MK: BMCo. Metal: Sterling. Length: 4 ¾ inches. Cost: $20.00. 192-9003-0116. Princess Margaret. BL: engraved: "Her Royal Highness Visit Canada 1958." Metal: Silverplate. No maker. Length: 5 1/2 inches. Cost: $12.00. 193-9003-0115. Churchill bust at finial. + "1874-1965." Stamped" Exquisite E.P.N.S. Length: 4 1/4 inches. Cost: $12.00.